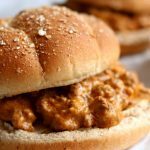 Homemade sloppy joe sauce and ground beef are simmered in the electric pressure cooker and then cream cheese is stirred in as a twist to make the best sloppy joes of your life. Serve the meaty sauce on toasted buns or even slider rolls for an easy weeknight dinner. This recipe can easily be doubled or tripled to serve a crowd. Turn your Instant Pot to the saute function. Wait until the display says HOT then add in the ground beef. Brown the beef for about 3-4 minutes then add in the onion. Stir and let the onion saute for 3-4 more minutes. Drain off any excess grease. Cover and secure the lid. Make sure valve is set to “sealing.” Set the manual/pressure cook button to 10 minutes on high pressure. Let the pressure release naturally for 10 minutes then move the valve to venting and release any remaining pressure. Stir the mixture. Add in the cream cheese and stir until it is melted. I used the saute setting to melt the cream cheese a little faster.